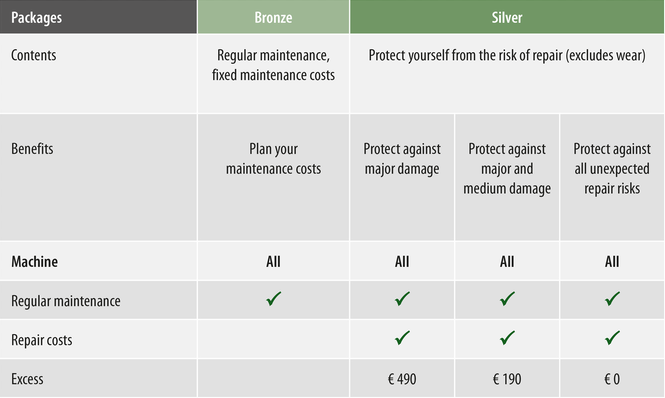 Protect your investment with Fendt Services from your dealer. The ultimate in uptime. You invested in cutting-edge engineering and design to get the job done right. Keep it that way with Fendt Services. The smartest tool for servicing your Fendt can’t be bought over the counter. The technicians at your Fendt dealer have extensive model and system training by Fendt. They also have direct access to Fendt and the very latest technical information for your machine. Bringing your machine to your dealer for service is the best way to ensure peak efficiency. Contact your dealer today. This service package includes all prescribed maintenance work bookable up to 10,000 hours for new and used machines. Professional servicing is carried out by Fendt trained technicians (on-site or at your Fendt dealer’s premises) according to manufacturer recommended intervals and checklists. In addition the programme is administered by Fendt. This means your dealer talks directly to Fendt to make claims on your behalf. It removes the need for third party involvement which can cause claim delays. You can apply for an extended warranty up to 12 months after registration of your machine, giving you time to consider operating hours required for coverage. We also offer the possibility to increase an existing extended warranty for longer time periods. Call your Fendt dealer today to discuss Fendt Care and receive a detailed quotation. *For tractors up to 8 machine years or 8,000 operating hours, for combines and forage harvesters up to 5 years or 3,000 hours. If it’s been a while since your last service, your Fendt dealer can carry out a visual health check and provide you with a quote for an interim or major service as required.